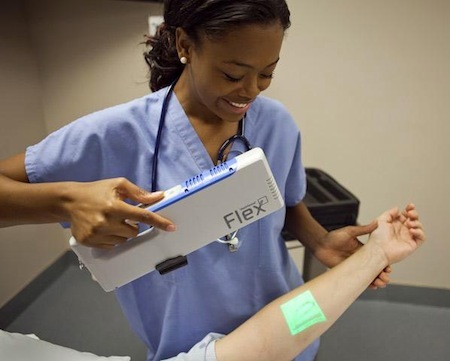 Flex, the first hand-held version of VeinViewer, is now available. VeinViewer uses an infra-red camera to highlight blood and then projects the image onto the skin, making it easier for health care providers to do necessary needle sticks. Hall looked over at the screen. It flashed a color image of his hand, with the veins showing in a pattern of green against a blue background.